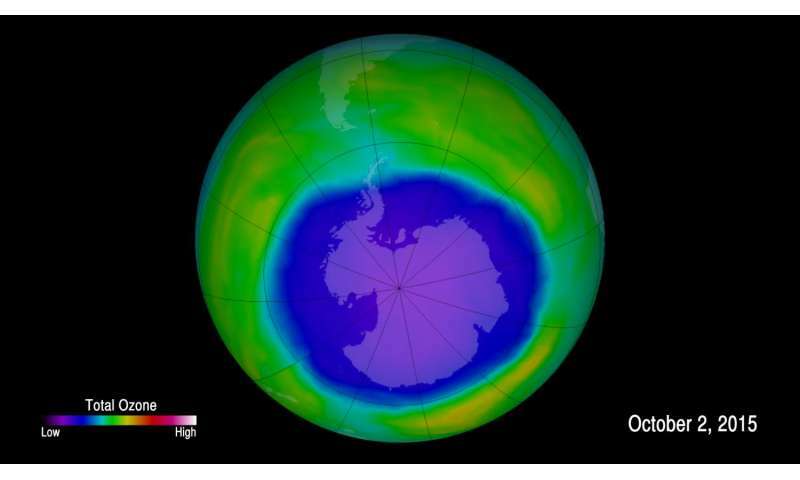 Scientists at MIT and elsewhere have identified the "first fingerprints of healing" of the Antarctic ozone layer, published today in the journal Science. The team found that the September ozone hole has shrunk by more than 4 million square kilometers—about half the area of the contiguous United States—since 2000, when ozone depletion was at its peak. The team also showed for the first time that this recovery has slowed somewhat at times, due to the effects of volcanic eruptions from year to year. Overall, however, the ozone hole appears to be on a healing path. The authors used "fingerprints" of the ozone changes with season and altitude to attribute the ozone's recovery to the continuing decline of atmospheric chlorine originating from chlorofluorocarbons (CFCs). These chemical compounds were once emitted by dry cleaning processes, old refrigerators, and aerosols such as hairspray. In 1987, virtually every country in the world signed on to the Montreal Protocol in a concerted effort to ban the use of CFCs and repair the ozone hole. Solomon's co-authors include Diane Ivy, research scientist in the Department of Earth, Atmospheric and Planetary Sciences, along with researchers at the National Center for Atmospheric Research in Boulder, Colorado, and the University of Leeds in the U.K.
Ozone is sensitive not just to chlorine, but also to temperature and sunlight. Chlorine eats away at ozone, but only if light is present and if the atmosphere is cold enough to create polar stratospheric clouds on which chlorine chemistry can occur—a relationship that Solomon was first to characterize in 1986. Measurements have shown that ozone depletion starts each year in late August, as Antarctica emerges from its dark winter, and the hole is fully formed by early October. Solomon and her colleagues believed they would get a clearer picture of chlorine's effects by looking earlier in the year, at ozone levels in September, when cold winter temperatures still prevail and the ozone hole is opening up. The team showed that as the chlorine has decreased, the rate at which the hole opens up in September has slowed down. "I think people, myself included, had been too focused on October, because that's when the ozone hole is enormous, in its full glory," Solomon says. "But October is also subject to the slings and arrows of other things that vary, like slight changes in meteorology. September is a better time to look because chlorine chemistry is firmly in control of the rate at which the hole forms at that time of year. That point hasn't really been made strongly in the past." They then compared their yearly September ozone measurements with model simulations that predict ozone levels based on the amount of chlorine that scientists have estimated to be present in the atmosphere from year to year. The researchers found that the ozone hole has declined compared to its peak size in 2000, shrinking by more than 4 million square kilometers by 2015. They further found that this decline matched the model's predictions, and that more than half the shrinkage was due solely to the reduction in atmospheric chlorine. "It's been interesting to think about this in a different month, and looking in September was a novel way," Ivy says. "It showed we can actually see a chemical fingerprint, which is sensitive to the levels of chlorine, finally emerging as a sign of recovery." The team did observe an important outlier in the trend: In 2015, the ozone hole reached a record size, despite the fact that atmospheric chlorine continued to drop. In response, scientists had questioned whether any healing could be determined. Going through the data, however, Solomon and her colleagues realized that the 2015 spike in ozone depletion was due primarily to the eruption of the Chilean volcano Calbuco. Volcanoes don't inject significant chlorine into the stratosphere but they do increase small particles, which increase the amount of polar stratospheric clouds with which the human-made chlorine reacts. As chlorine levels continue to dissipate from the atmosphere, Solomon sees no reason why, barring future volcanic eruptions, the ozone hole shouldn't shrink and eventually close permanently by midcentury. "What's exciting for me personally is, this brings so much of my own work over 30 years full circle," says Solomon, whose research into chlorine and ozone spurred the Montreal Protocol. "Science was helpful in showing the path, diplomats and countries and industry were incredibly able in charting a pathway out of these molecules, and now we've actually seen the planet starting to get better. It's a wonderful thing." They tracked the yearly opening of the Antarctic ozone hole each September from 2000 to 2015, analysing ozone measurements taken from weather balloons and satellites, as well as satellite measurements of sulphur dioxide emitted by volcanoes, which can also enhance ozone depletion. And, they tracked meteorological changes, such as temperature and wind, which can shift the ozone hole back and forth. The reason there is an ozone hole in the Antarctic is that it is the coldest place on Earth—it is so cold that clouds form in the Antarctic stratosphere. Those clouds provide particles, surfaces on which the man-made chlorine from the chlorofluorocarbons reacts. This special chemistry is what makes ozone depletion worse in the Antarctic. These polar regions are still not well understood, and there remains thoughtful debate -- apparently elsewhere -- over the true causes of the ozone changes. The idea that it all boils down to chemistry completely ignores the fact that this is where the Earth makes its closest contact with the solar wind. There are in fact vertical winds in these areas which are really quite dynamic in that they can suddenly shift in either direction. It's unlikely that the current models are doing a very good job of modeling all of the various phenomena happening here, and people should keep an open mind as to what is really going on in these regions. Pointing to this as some sort of success story is premature and wishful thinking. .. there remains thoughtful debate -- apparently elsewhere -- over the true causes of the ozone changes. Are you thinking of Steven Wilde, who claims himself to be a fellow of the Royal Meteorological Society, but whose name cannot be found on their roles (https://www.rmets...ellows)? Welcome to my Physorg Oubliette, from which you will not emerge. considering "scientists" have never seen the antarctic without the so-called ozone hole. how do they know what is "healing" and what isn't. All I know for certain is that CFCs weren't banned until right before duPont's patent ran out and their new replacement for CFCs was granted a new patent. Smells like Hillary's bloomers or algores socks. The idea that it all boils down to chemistry completely ignores the fact that this is where the Earth makes its closest contact with the solar wind. What about the arctic? Is there an ozone hole there? There are in fact vertical winds in these areas which are really quite dynamic in that they can suddenly shift in either direction. It's unlikely that the current models are doing a very good job of modeling all of the various phenomena happening here, and people should keep an open mind as to what is really going on in these regions. I would call it detailed observation. One more denier lie dies: "It's a natural phenomenon, and anyway, we can't do anything about it." We did something about it. Now it's going away. It took a long time for the Montreal Protocol to take effect. We're lucky it didn't get worse. Of course the deniers have forgotten that all the same arguments were made to obfuscate the depletion of the ozone layer as are being made about global warming. Same with smoking. Same with acid rain. Same with leaded gasoline. The same bullsh*t over and over and it's no truer this time than it was all the others. Well said Da Schneib, and the good is that more and more people are starting to realize how selfish and greedy big oil and their filthy partners are.